Wouldn’t it be great to have enough time for a long, leisurely ride every day? Unfortunately, a busy schedule with a host of other commitments often pushes riding time to the back burner. But it doesn’t have to be that way. You can still fit a ride—albeit a short one—into your summer day, even your lunch hour, with this easy plan. A couple of caveats first: We’re not counting travel time, so if your horse is 20 miles away, you’re pretty much going to use all your time sitting in the driver’s seat, not on your horse’s back. Also, you must realize up front that this is a short ride, one that is going to give your horse a little exercise, and possibly a chance to work on one schooling lesson, but not a barrage of issues. 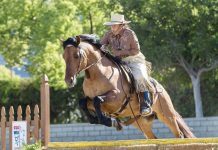 Finally, you’ll have to forgo a few of the niceties that you’d normally do for your horse and save them for the days when you have a freer schedule. 1. The first step is to prepare in advance: Have all your equipment at the ready. There’s no time to spare trying to find your favorite body brush or using complicated leg protection. Use legwear that is easy to put on and doesn’t involve spiraling wraps or lots of buckles. Always keep your equipment organized and accessible. And arrive dressed and ready to ride. 2. Minute 1 – 2: Get your horse from his pasture, stable or paddock, and bring him to your tack-up area. Tie him securely, and not just for safety’s sake. 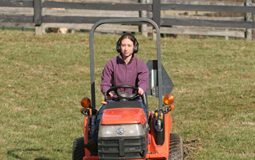 A horse tied properly means that he won’t be fidgeting or pulling while you are working around him, possibly costing you precious seconds. 3. Minute 3 – 6: Use one grooming brush only, and give a speedy once over, paying the most attention to the saddle and girth area. 4. Minute 7 – 9: Pick out feet and use this time to quickly examine hooves, shoes and legs. Apply any protective legwear. 5. Minute 10 – 11: Put saddle pad and saddle on the horse’s back. 6. Minute 12: Adjust the girth or cinch. Use equipment already fitted to your horse, where you know which holes you normally adjust to. 7. Minute 13 – 15: Put on bridle and make any final adjustments. 9. Minute 17 – 21: Allow your horse to walk and stretch. Even though he is only walking, make this time count. Urge him to lengthen his stride, or use suppling exercises to loosen him up. Do your own exercise as well: stretch down into your stirrups, spread out your arms, elongate your back. 10. Minute 22 – 41: This is your core riding time. Sure, it’s brief, but 20 minutes of solid trot and canter work is a good workout. Because it’s a short ride, make it interesting for your horse. Use figures and transitions to keep things lively. 11. Minute 42 – 47: Walk on a loose rein and let your horse cool down for five minutes. If you’ve conditioned your horse, he will easily catch his breath during this time. 12. Minute 48 – 51: Dismount, take your horse’s tack off and hang it up. Wipe girth and bit down. Forgo any other tack cleaning. 13. Minute 52 – 57: Grab a synthetic body brush (in lieu of a sweat scraper) and rinse your horse at the wash rack. This will further cool him off. Use the body brush to whisk away the excess water. By using the brush, you are doing double duty: Your horse is getting groomed, and you are pulling the water from his coat. Save shampooing for the weekend. 14. Minute 58 – 59: Take your horse back to his home. 15. Minute 60: Lock up your tack room, grab your car keys and head out. Bring baseball cap to cover helmet hair. Baby wipes serve as a shower in a bottle, too. There you have it. Short and sweet, and not recommended for every day, but when you are short of time, isn’t it good to know it’s possible to spend a fruitful hour with your horse instead of in the lunchroom? Good ideas. Need to add 1 or 2 minutes to gather equipment up. i only have 1 question-What if your horse(s) rolled in the mud the night or day before?and the horse has wet mud on 1 side and dry mud on the other.what should you do? glad to know that others live like I do. Great article! This is my norm! On weekends and on really cold days when I don’t ride, I give a good grooming to all the horses. Love it thanks for helping now I most deffinetly will be able to spend more quality time with my ponies not just riding! Thanks Moira! this is so funny! good idea too!